Every state has at least one veterans home and some states like Oklahoma have six or seven of them. There is great demand for the services of these homes but lack of federal and state funding has created a backlog of well over 130 homes that are waiting to be built. We will discuss this problem in the section below entitled "Challenges Facing the Construction of New Homes". Aside from seeking long term care because of an expectation of entitlement are there any other reasons that veterans would prefer a State home? We asked this question of ourselves because we have noticed that in some states veterans homes are in distant rural areas. The fact that some of these homes are hundreds of miles from urban areas where the majority of veterans would tend to live, made us wonder why some veterans would move long distances to reside in these facilities. A financial incentive for the veteran is that all state veterans homes will apply for the pension benefit for those residents who are eligible. Federal law prohibits VA from paying any more than $90 a month to single veterans who are eligible for Medicaid in a non-veteran nursing home. State veterans homes are exempt from this rule and the single veteran can keep the entire pension amount although most of it will have to apply to the cost of care. 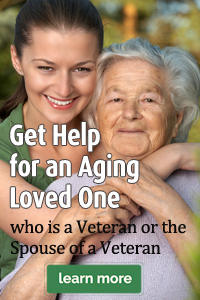 "The demand for quality long term veteran care is growing at an astounding rate. Our nation faces the largest aging veteran population in its history. Today, roughly 10 million veterans are aged 65 and over, about 39 percent of all the veterans in America. This proportion will remain unchanged for the next 20 years. The number of veterans aged 85 and over will have increased by 600 percent from 1990 to 2010 and will total nearly two million in all." "America's veterans homes face serious resource shortfalls. Ideally, home costs are shared equally by the Department of Veterans Affairs, state governments and residents. The reality is that 11 states currently provide little or no funding for their veterans home. And the others now face the worst fiscal crisis in 20 years, with two thirds of the states now reporting substantial cuts in programs serving low-income residents, including veterans." "State Veterans Homes are one of the largest long term care providers in the United States. During 2005, State Veterans Homes furnished 6,852,875 days of nursing home care and 1,477,885 days of domiciliary (assisted living) care. As of February 13, 2006, there were 133 State Veterans Homes in 50 states and Puerto Rico with 30,255 total beds." In 1888, the U.S. Congress authorized federal cost-sharing for state veterans homes--about 30 cents per resident per day. Since the creation of the Veterans Administration in 1930, the program's per diem payments for 2010 have increased to $77.53 per day. The Veterans Administration pays the state veterans homes an annually adjusted rate per day for each veteran in the home. This is called the per diem. The 2010 nursing per diem amount was $77.53 and for domiciliary care rate was $35.84. Adult Day Health Care – up to one-half of the cost of care -- cannot exceed $66.13 per day for 2010. The goal of state veterans homes is to get Congress to increase the per diem rate for nursing care to 75% of the state private nursing rates. In most states the per diem falls well short of this goal. For 2011 the per diem rates are $94.59 for nursing home and $38.90 for domiciliary. The adult daily rates were not announced as of this writing. These nursing home reimbursement rates represent a significant increase over 2010 rates of 18.04%. The per diem program and construction subsidies mean that State veterans homes can charge less money for their services than private facilities. Some states have a set rate, as an example $1,600 a month, and they may be relying on the pension benefit with aid and attendance plus the per diem to cover their actual costs. Other states may charge a percentage of the veterans income but be relying on other subsidies to cover the rest of the cost. Still, in other states, the rate may simply be the difference between all of the subsidies and the actual monthly cost of operation. States without set rate subsidies may charge 50% to 70% of the rate of private facilities based on private or semi private room occupancy and if the veteran does not have enough income, these homes accept Medicaid or Medicare to make up the difference. In these states the veterans homes are Medicaid and possibly Medicare certified. Approximately 30% of all state veterans homes are CMS certified.